The MR43 is one of our most popular machines and meets a variety of irrigation needs including single pass coverage on football fields, large riding arenas, small acreage irrigation, and much more! Built with a three wheel chassis design and integrated stabilizer hitch, the MR43 has a flow range from 15 to 60 gallons per minute and a 393 feet hose length. 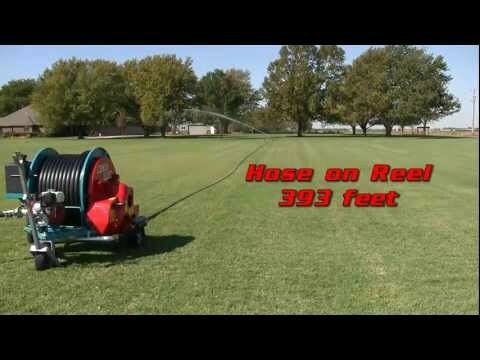 The MR43 can effectively water up to 1.5 acres in a single pull! The ability to add the reliable on board Honda boost pump kit with auxilliary large capacity fuel tank for longer run times, can greatly enhance performance in low-pressure situations. Machine Weight (Dry) - 538 lbs. Palletized Weight - 783 lbs.